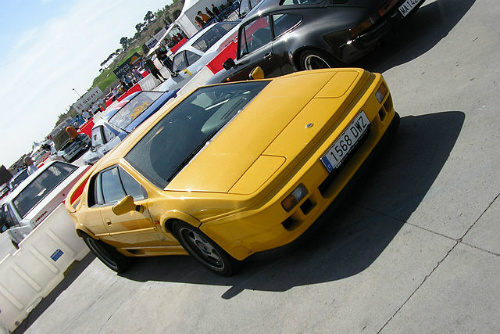 The Lotus Esprit Sport 300 sports car received its body styling from Julian Thompson, the chief designer at Lotus. The car was originally presented in the form of a concept at the NEC Motor Show in Birmingham in 1993, and was an immediate success, notwithstanding the fact that it was coloured bright yellow. It was conceived as a limited edition sports car with a target market of about 50 units and was, in essence, the road going version of the Esprit X180R. In the end, 64 units of the Sport 300 were built over a two year production period. Such a used Lotus had a good market potential. Although it had a price tag of nearly £65,000, it was still cheaper than a Ferrari 348TB. The rest of the car was, in fact, a variant of the Esprit X180R which was entered, with great success, during the 1991 to 1993 seasons, in the America World Challenge series, sponsored by the SCCA (Sports Car Club of America). It embodied a four point braced frame which provided additional tortional rigidity, something that had always been lacking in earlier Esprits. Unusually for Lotus, it was fitted with a limited slip differential, which came as standard equipment. The overall weight of the car was reduced by the extensive use of composite materials. It had powered assisted steering, and the suspension geometry was modified with much stronger coil springs and dampers, which were fitted all round. Furthermore, the front track was increased, whilst that at the rear was widened by two inches. A very noticeable feature of the car were the OZ three piece wheels, which measured 8.5x16 inches at the front, and 10.5x17 inches at the rear, and produced outstanding grip and braking. It sported 327 mm front ventilated discs with 280 mm discs at the rear, used racing calipers, and was backed up by a Delco ABS anti lock braking system. It was powered by a Lotus 910S, 2174 cc, 16 valve, twin overhead cam engine, linked to a revised Garrett T3/T4 turbocharger, and a charge-cooler (intercooler). With a compression ratio of 8.0:1, it was fitted with Delco Multi Point Fuel Injection. Using enlarged inlet valves, polished inlet ports, and a recalibrated engine management system, it developed 302 bhp at 6400 rpm, and 287 ft/lbs of torque at 4400 rpm. Hence the name Sport 300. With a power-to-weight ratio of 243 bhp per ton, this was on a par with the Porsche 911 Turbo 3.6 of the period. It had a 0-60 mph time of 4.7 secs, a 0-100 mph time of 11.7 secs, a standing 1/4 mile time of 13.4 secs, and a top speed of 161 mph. A variant of the Sport 300 was to be found in the launch, in 1999, of the Lotus Esprit Sport 350, featuring a V8 engine. A 1993-94 Lotus Esprit Sport 300 in very good condition would fetch in the region of £25,000/$40,000 to £30,000/$50,000.